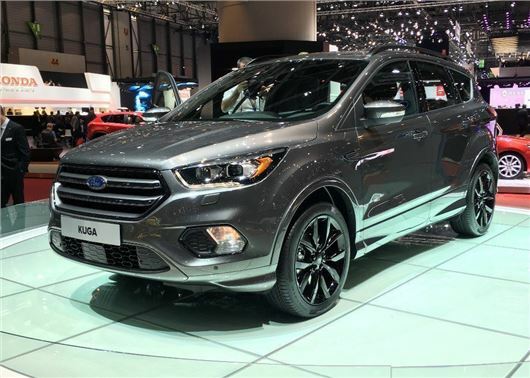 Ford has unveiled the facelifted version of the Kuga at the Geneva Motor Show 2016. The revised crossover gets new styling, improved in-car connectivity and lower running costs, thanks to a new 1.5-litre diesel engine. The updated Kuga will reach the UK in December and be priced from £20,000. The exterior styling is similar to the Ford Edge - which is due in showrooms later this year - with new bumpers, horizontal trapezoidal grille and LED daytime running lights. Ford has also added a new colour scheme - Copper Pulse - to the options list along with a power-operated retractable tow bar, which will automatically store itself out of sight below the rear bumper when not in use. The new 120PS 1.5-litre TDCi diesel engine will not replace any of the engines in the current Kuga line-up, but will lower running costs, with the new four-cylinder unit returning an official 64.2mpg and 115g/km CO2. The new diesel engine will be limited to front-wheel drive only and be offered alongside the current 2.0-litre diesels and 1.5-litre EcoBoost petrol engines. The interior switchgear has been revised too, with larger buttons and dials to make it easier to use on the move. There's also a new Sync 3 infotainment system, with improved voice control that will let the driver find petrol stations or car parks by simply saying "I need petrol" or "I need to park". The Sync 3 system also gets a new eight-inch touchscreen that will allow the user to use pinch and swipe gestures to browse the menu systems and program the navigation.